I don’t really get excited about single-purpose utilities for the iPhone and iPod touch. But Sophiestication Software’s Groceries app merits the excitement. It makes grocery lists easy to create, manage, and—dare I say—a little fun. Wanted List: Using Groceries’ extensive database of products, it’s easy to add items—whether they’re brand names or not—to your shopping list. Groceries allows you to create as many shopping lists as you want—I create lists for different markets that I shop at, for example—adding items using the plus button in the bottom right corner of the screen. Tapping that button brings up a search box, where you enter the item you want. Groceries searches as you type, pulling up both generic items (soda) and name-brand products (Coca Cola). The app has a large database of items, and it remembers new ones that you enter. Groceries sorts items in your list by aisle, which is quite convenient—it makes sorting through long lists easy. Groceries is fast, starting almost immediately and pulling up search results instantaneously. It is also very simple; crossing off items just requires a tap for Groceries to remove it from the list. While simple to use, it still offers a lot of functionality. You can designate certain items as favorites, add notes and quantities, and move items from one aisle or list to another. These features don’t distract from Groceries’ central functionality—adding and crossing off items as you shop. The app is also quite beautiful, with a corkboard background and custom interface widgets that make it feel like a real grocery list rather than a regular app. Groceries’ unique look makes it a joy to use. I have only one complaint: the app’s Search view. After checking items to add to a list, the only way to get out of the search is to tap the Cancel button. You might think that tapping cancel would undo whatever you’ve just done—in this case, adding items to a list. But that’s not what happens—instead the items you’ve added are saved to the list. Groceries should come up with another word to signify what it actually does in this instance—Done or Save would do quite nicely. Still, after you get used to this wording quirk, it becomes a minor issue. Groceries is a lovely application, which is fast, simple to use, and makes buying groceries a little more enjoyable. And for me, that’s quite an accomplishment. 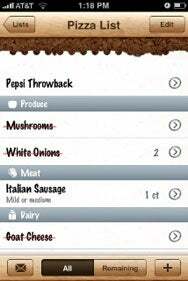 Groceries is compatible with any iPhone or iPod touch running the iPhone 2.2 software update.